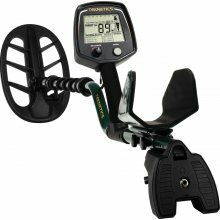 The Teknetics T2 is a new high-performance multi-purpose professional grade metal detector. It utilizes the latest advances in electronic technology, and its functional design represents the leading edge of the metal detector engineering art. The T2 is easier to learn to use properly than other comparable metal detectors. Its combination of light weight and balance provides comfort unmatched by any other detector in its price range. Its most popular uses include coin-shooting, relic hunting, and gold prospecting. The T2 has a Large LCD Screen with Target Identification Display, giving you a Straightforward Menu-Driven User Interface Menu System which is Always Visible. Low Operating Cost - More than 40 hours with 4-AA batteries. The arm rest WIDTH and POSITION are both adjustable.